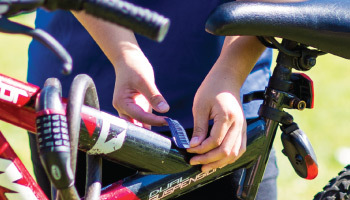 Bicycle security is a priority for UCI, and there are many ways to prevent bicycle theft. If you follow the suggestions below, you will be securing your bicycle the best way possible. Always lock your bike. Whether you store your bike in a garage, dorm room, apartment, or even if you leave it for “just a minute,” use your lock. Use a U-shaped high security lock. Lightweight cable or chain locks no longer provide adequate security in most cases, as they can be easily cut. The best choice is a strong, reliable U-lock. Even better, use both! Use the lock correctly. Position your bike frame and wheels so that you take up as much of the open space within the U-portion of the lock as possible. The tighter the lock up, the harder it is for a thief to insert a pry bar and pry open your lock. Only use designated bike racks. 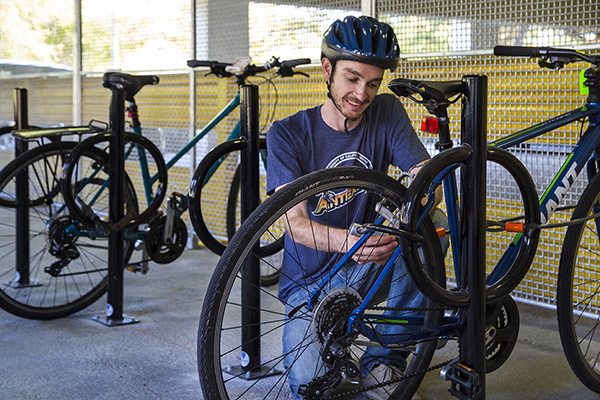 Lock your bike to permanent, anchored bike racks around campus. Avoid theft and impound by using these fixed racks. Never lock to small trees, handrails, posts or chain link fences. For a map of the bike rack locations, click here. Secure your components and accessories, especially those that can be easily removed, like quick release wheels or seats. Security devices are available at bike shops. 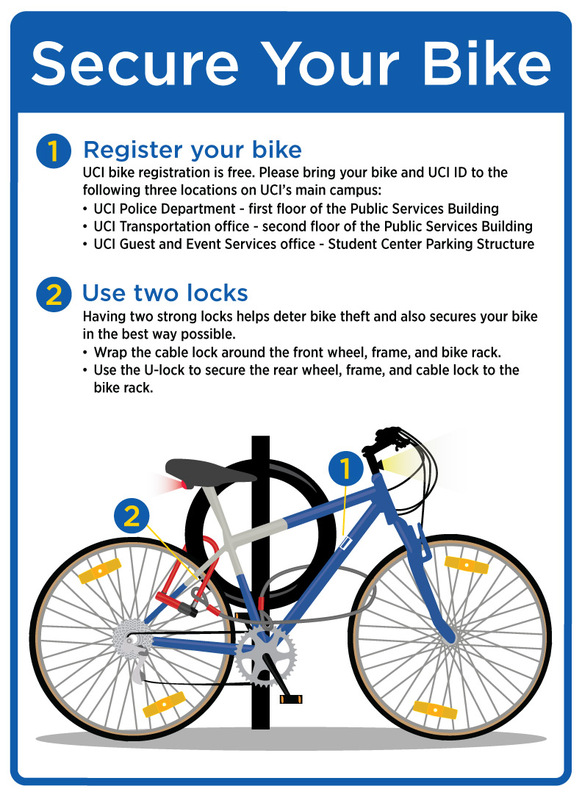 If, in spite of these precautions, your bike is stolen on campus, be sure to report it to the UCI Police Department at (949) 824-5223. Call Guest & Event Services at (949) 824-2691 to check if your bicycle has been impounded. 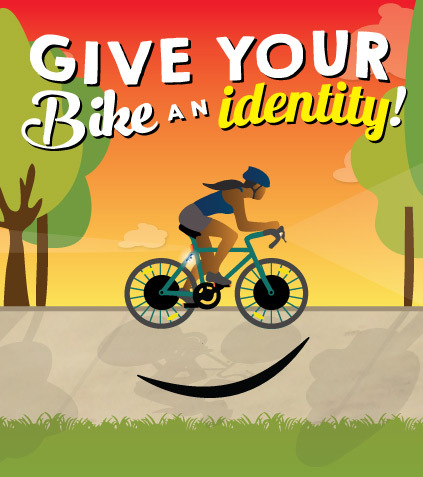 Registering your bicycle is now required for UCI and is an important step in securing your bicycle and preventing theft. Deterrent to theft – Having your bike’s serial number on file makes it much harder to resell. Proof of ownership – Parking can cut your bike lock if you forget your lock combo or lose your key. Contact prior to impound – If you leave your bike parked for an extended period of time we can attempt to contact you prior to putting the bike into salvage. Recovery if stolen – If your bike is lost or stolen, having it registered gives you a chance that it might be returned to you if located. Registration is free and lasts forever (or until transfer of ownership). Begin the registration process by visiting our BOTS website. Once you have completed the pre-registration, bring your bike to the UCI Transportation office located on the second floor of the Public Services Building to confirm the information and get your registration sticker.